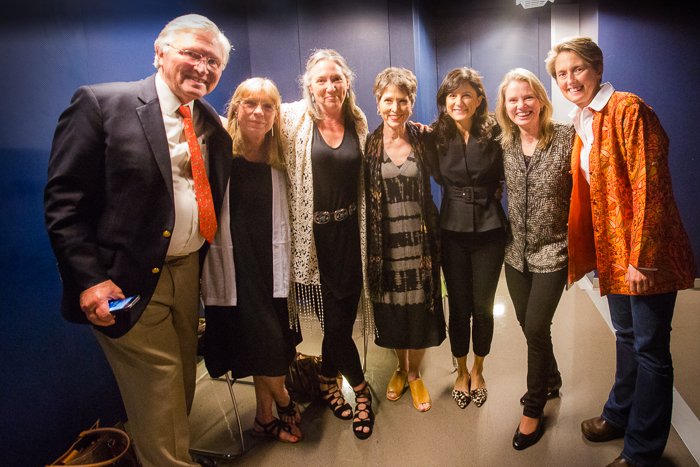 Rick Solberg, Patti Trabon, Megan Wyeth, Patty Reece, Ami Vitale, Carol Barlau and Shari Hartbauer backstage after Ami’s lecture, “My Eyes, Your World” at the Kauffman Performing Arts Center. I’m really grateful for being part of a group of women photographers recognized last night by Rick Solberg, a Redpoint Collective member and excellent photographer in his own right. Rick sponsored the National Geographic Live lecture yesterday evening by photographer Ami Vitale at The Kauffman Center for the Performing Arts. The other photographers Rick honored this evening are Carol Barlau, Patty Reece, Patti Trabon and Megan Wyeth. Although I’ve tried to be modest about this, I really enjoyed sharing this honor with such a fine group of photographers. It was a thrill to meet Ami. Her poignant lecture, “My Eyes, Your World” was inspirational and without doubt the best of this year’s National Geographic Live lecture series. It will be hard to forget the many stories she shared and her passion she has for pandas and rhinos. Her energy and the positive enthusiasm she shares through her images will inspire all of us for a long time.